Join two of Iceland’s best known photographers for this workshop in one of the most fascinating countries in the world. Effi and Ragnar have an intimate knowledge of Iceland´s land and people and will guide students to become better photographers and experience Iceland in a personal way. This class is for photographers of all levels interested in developing their fine art and documentary photography. Ragnar Axelsson has dedicated his career to the subsistence hunters, fishermen and farmers of the circumpolar area that live on the fringe of the habitable world. Since the early 1980’s he has travelled to the Arctic, documenting the lives of the Inuit hunters in Northern Canada and Green-land, the farmers and fishermen in the North-Atlantic region and the indigenous people of Northern Scandinavia and Siberia. His stories have appeared in print media publications such as Time magazine, Life, Stern, GEO, Polka, Wanderlust, Geographical and Newsweek, and are the subject of his major photography books: Faces of the North (2004 – republished in an extended version in 2015), Last Days of the Arctic (2010) and Behind the Mountains (2013). Behind his oeuvre is a strong conviction that the traditional culture of the Arctic people is disappearing and will not be able to resist the disrupting effects of larger forces of economy and climate change. In 2011 a documentary on his work was released, Last Days of the Arctic – Capturing the Faces of the North, produced by BBC4, NDR, ARTE and ITVS. 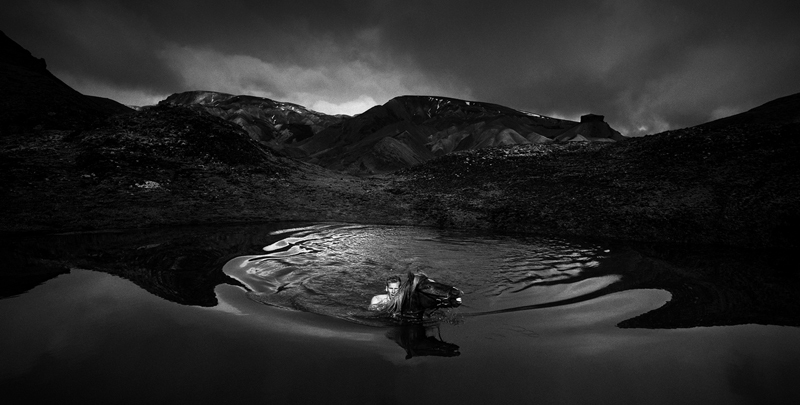 Ingólfsson in one of Iceland’s best known art and documentary photographers. His work includes photographs of authors, taken for various publishing houses, and photographic narratives compiled in a host of countries, including India, China, Bolivia, Peru, Australia, the United States, Canada, and the Faeroe Islands. He has taught extensively in The Photography School in Reykjavik, the Iceland Academy of Arts and the last years he taught a workshop with his mentor and friend Mary Ellen Mark in Reykjavik. He has edited a number of photographic books and lectured widely on photography.Among Effi’s books are Saga-Sites – In the Footsteps of W.G. Collingwood, nominated for the Icelandic literery price and the exhibition mounted in Reykjavik and New York City; a book of travel essays, written and photographe;; The Selection, on the history of Icelandic photography, and nine books on flyfishing and nature in Iceland.